So, someone opens a new 8c in SA and we don't hear a single word about it or see a single picture of it on this website. What's up with that? Why are random European repeats more newsworthy than this? mmmm pehaps the sender or an associate should do a little write up? I'm sure justin would be more than happy to post......super impressive though! and what's with the #crtisisethisbitches on 8a, huh ebert? Flex wrote: So, someone opens a new 8c in SA and we don't hear a single word about it or see a single picture of it on this website. What's up with that? Why are random European repeats more newsworthy than this? 100% agree with you Flex, please send me details / a name and I'll get on it. Ebert at Chosspile is all I know. The South African climbing community gives a flying bucket of fish scales about hard sends. Unless you trading or hiking 16s, you might as well not post it. Unless you sending 36 its not internationally newsworthy either. Thanks for noticing tho Flex:) Brian your psych is sooooo great, love it. Its time to raise the bar to the next level. Time to train harder because im weak. The extension to The Megalomaniac has been bolted. Time to blow some minds by sending something unfathomable. Last edited by Forket on Thu Jul 30, 2015 8:54 pm, edited 1 time in total. Ai tog Ebert. Eendag gaan almal jou respekteer en wens hulle was so goed soos jy. Im not looking for respect, im looking to advanve SA climbing to a level that foreigners see more than just Rocklands and Waterval Boven. You live in the dark ages and are most likely one of those snobs that will rather hide cool problems then share them with the world. Media coverage is the only thing that will help our sport grow nationally and internationally, but you are too closed minded to see this. Harder routes/problems draw foreigners. Not some scramble up the drakensberg (unless you have a cable car to attract all the weak #TM). I want this sport to grow. Last edited by Forket on Thu Jul 30, 2015 8:33 pm, edited 2 times in total. You truly are a master at constructing logical fallacies, I wish to thank you again for providing me with a significant chunk of joy that is derived from reading your post(s). I get it, you want to advance the standard of Sportclimbing in SA. Stop faffing about your desires and my dark-ages mentality(whatever that means,probably nothing) and f@cking advance things then(whatever that means). "Een swaeltjie maak nie 'n somer nie", Afr Proverb. Forket wrote: For instance, at the moment Brian's vid of Rolihlahla lies there with not a single person in this community congratulating him, like wtf? Did BrianW send?! Woohoo, nice! Looking forward to the vid of Megolomaniac! I think Ebert deserves some serious congratulations on his send and on the advanced level of his climbing! Don't worry Ebert everyone is sitting up and looking at your achievement and I think we get that you are trying to encourage everyone to do hard sends! It may help a bit if you didn't sour everyone's view of this grand achievement by having a bad attitude to all those climbers out there who aren't climbing at your level! At this point I would like to support your comment that climbing is indeed a lifestyle - and that everyone puts into it what they can - particularly those who bother with a forum. Now maybe it is your own personal twist on life to come across a certain way, but I think that if you recognise that someone who enjoys climbing 16's is a "valid" climber then you may be able to not come across with so much vitriol and aggression. Strangely enough your sponsors rely on those very people - the weekend warriors - to make bringing stock into the country viable etc. So I would like to say a word of encouragement and to echo that this is a great achievement! I would also encourage you to go on to greater things! I would also suggest a little less of an aggressive twist in your attitude to your fellow climbers will bring more on board in praising you in these great achievements! Old Smelly wrote: Now maybe it is your own personal twist on life to come across a certain way, but I think that if you recognise that someone who enjoys climbing 16's is a "valid" climber then you may be able to not come across with so much vitriol and aggression. Strangely enough your sponsors rely on those very people - the weekend warriors - to make bringing stock into the country viable etc. And just to stir the pot a little more... It is a bit of twist, or perhaps ironic that Ebert is becoming the poster boy for people climbing grade 16 who want to climb more often and harder (I'm sure many of us will hold on harder and longer whilst moving through crux moves just thinking about him - I know that I do ). Not to mention our choice of climbing gear may well be influenced by his ability to climb well. Looking forward to the extension! Something also needs to be said about Andrew Pedley helping everyone willing to fight for it to push their grades! Well done Andrew on all the work done with new routes and hard sends, some even done by foreigners on your hard work! I agree with Justin - keep going Ebert - focus on the extension and not on naysayers or conflict - you are indeed going to be inspiration for many others to go for it! This may be a unusual response but I think it's something to consider. Matthew 16: 26. For what will it profit a man if he gains the whole world and forfeits his soul? Sorry for my rampant cynicism but rock climbing is a bit of a narcissists sport anyway - everyone climbs for themselves. There is no delusion that we do it for the greater good of humanity or for some greater community vibe. We climb for the challenge, the experience, the fun - and yes to push ourselves. Alex Lowe is credited with the saying that we all know- "The best climber in the world is the one having the most fun!~"
Still I think we need to cheer on those who push themselves as hard as they can - like Ebert is doing. That is what we find inspirational and admirable! We all have different priorities and our climbing is in their somewhere but you have to admire those who have put in the time and effort to see their goals achieved. At this point is his life he has no money but he has lots if VIM - and look at what he is achieving! I still say GO FOR IT! Its a bit like a soap opera. Drama, comedy, anger, irony,sarcasm, insults... All we need now is a love triangle! I find it quite amazing how you are able to create controversy and mayhem where previously there was none. That is quite a skill. 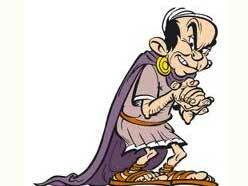 It reminds me of this little guy from Asterix and the Roman Agent. Want to see that video! Also, Ebert was part and head of the Tuks University club where helping people climb 16s, taking care of Pretoria's facilities and getting psyched and into the sport is the mission. Feel that should be mentioned. Hikers can take the abuse.